There are many good reasons why local pet owners should consider spaying or neutering their pets. Not only is it the best thing that we can do to help control the pet population, but it can also be good for the long-term health of your pet. It is a good idea to speak with your Southeastern Massachusetts veterinarian at Anchor Animal Hospital in Dartmouth to find out more about the very important type of vet care for cats and dogs. They will help you to make a decision that is right for you and your pet that will help him to have a long and happy life. 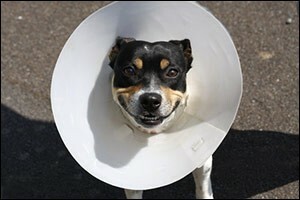 When it comes to getting your pet spayed or neutered there a couple of options to consider. Most people think that there is only one method employed, but as with everything else in life, there is rarely a one-size-fits-all solution. Below is a list of the different options available. New Bedford pet owners should speak with their veterinarian to find out which type of surgical or non-surgical sterilization would be best for their pet, depending on their unique situation and health history. Common Spay or “Ovariohysterectomy” – This is the most common surgical sterilization available for females via traditional vet care for cats and dogs. In this surgery, the ovaries, fallopian tubes and uterus are removed from the pet, making her unable to reproduce and eliminating the “heat” cycle completely. Common Neuter or “Orchiectomy” – This is the most common surgical sterilization available for males at your Southeastern Massachusetts veterinarian. In this surgery, the testes are removed from the male cat or dog, making him unable to reproduce and either reducing or eliminating the breeding behaviors or drive to find females. Hysterectomy – This surgery is another option available to female cats and dogs, which includes the removal of the uterus and part of the fallopian tubes. This will make the female unable to reproduce, but keeps her production or hormones intact due to the presence of the ovaries. Vasectomy – This surgery is another option available to male cats and dogs. It only removes the “vas deferens”, which conducts the sperm from the testes. The pet will be unable to reproduce, but he will still have the hormones because the testes remain intact. Non-Surgical Sterilization – This method is currently only available and approved to use to neuter male dogs. It involves an injection into the testes to stop the production of sperm to render the dog infertile. However, hormones are still produced, which means the dog might still have the urge to breed. Beyond controlling the local pet population, which is a concern as shelters across the nation are overcrowded and there are many pets who need homes, there are lots of other reasons to spay or neuter your pet as part of your regular vet care for cats and dogs. New Bedford pet owners should speak with their vet at Anchor Animal Hospital in Dartmouth as early as possible to make a plan for spaying and neutering. Behavioral Problems – When you spay or neuter your cat or dog, you can reduce or eliminate some of the behavioral problems that pet owners see in their pets that have the instinct to mate. Heat cycles in female pets can cause a lot of owner frustration. Breeding instincts in males can help to calm them down and reduce the inclination to try and “get to” females by getting out of the yard or breaking out of the house. Health Risks – Spaying female cats and dogs early on can help to provide protection from an array of health risks that could affect them later in life. Breast cancer and uterine infections are among the most common. Male pets that are neutered at an early age also have a reduced risk of developing testicular cancer or enlarged prostate glands. While there are risks associated with any type of surgery, the incidence of complications with common spaying and neutering is very low. Some veterinarians recommend the alternative surgeries and non-surgical solutions because the removal of hormones can result in additional risks for health problems, such as incontinence and some types of cancer. This is why it is best to speak with your Southeastern Massachusetts veterinarian to ensure that you are providing the best possible vet care for cats and dogs based upon their unique situation and needs. New Bedford pet owners and pet owners from all over the South Coast region have trusted the experienced veterinary team at Anchor Animal Hospital in Dartmouth, Massachusetts since 1975. We provide a wide variety of vet care and emergency vet care services for cats, dogs, rabbits and various pocket pets. To find out more about our services or to set an appointment for a vet check-up for your family pet, give us a call at 508-996-3731.